The nip of fall is in the air and I’m about to make a million* pot pies. To get started, we’ll need pie crust dough. This is a fantastically easy recipe that yields perfectly savory pot pies with light, flakey crusts. What should I put inside? Please share your favorite pot pie recipes in the comments, I’m taking suggestions! You can divide the dough into as many sections as you like depending on the size of your baking dishes. This recipe makes three nicely-sized, easily usable sections for me. I like to keep at least one extra section on-hand in the freezer: after an overnight thaw in the fridge, you can have a weeknight pot pie in about an hour! Making the dough should take less than 10 minutes. If you are making the dough for immediate use, it needs to chill for about 30 minutes before use. * May be an exaggeration. 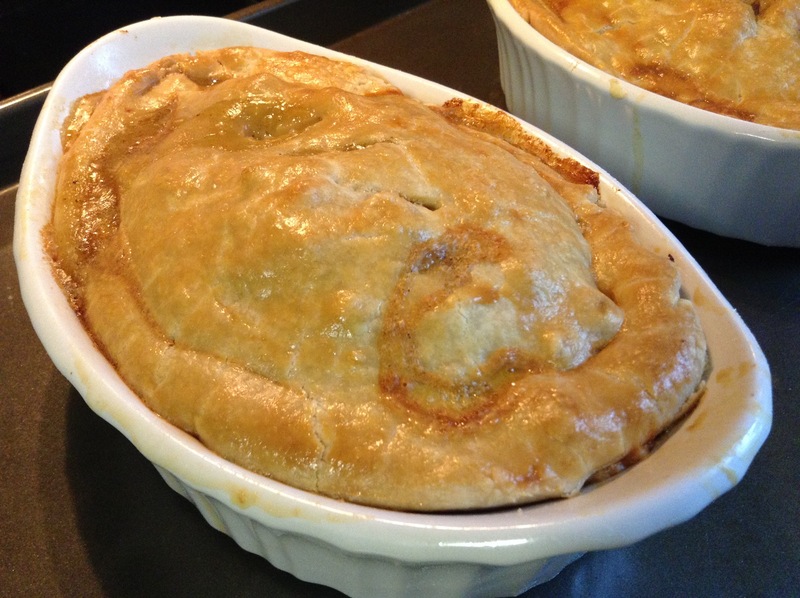 Sausage Pot Pies hot from the oven! In the bowl of your food processor, add the flour, salt, and baking powder. Pulse to combine. Add the vegetable shortening and butter. Pulse until the fat and flour mixture has the consistency of sand. Let the processor run while pouring the ice water into the bowl in a thin stream. The dough will come together on one side of the bowl. Turn the mass of dough out onto a lightly floured surface and quickly gather it into a uniform ball. Divide the ball into 3 equal parts and form them into rough discs. Wrap the discs individually in plastic wrap and put them into the refrigerator to chill until needed or freeze up to 3 months and defrost over night before use. Remove the dough from the refrigerator 5-10 minutes before you want to roll out your pie crust. Sprinkle your counter with flour and roll out 1 dough section to about 1/8 of an inch thick to fit the bottom, up the sides, and over the edge of your baking dish. Lay the rolled-out dough into your dish, lightly pressing it into the corners and up the insides of the dish. Roll out another dough section in the same way for the top and lay it over the pie filling. Pinch together the top and bottom crusts along the edges. (If the edges don’t match up exactly, just tuck them in and pinch the dough to the dish instead.) Brush the top and edges of the pie with egg wash and make three 3/4 inch slits in the top of each with a sharp knife. Bake for about one hour in a 350 degree oven until the crust is golden brown and the filling is bubbling inside. Let pie cool on a wire rack for about 10 minutes before serving. Yum. A blogger after my own heart. I LOVE pot pie (and the best part is the buttery crust). I’ll have to try this one out. Thank you!